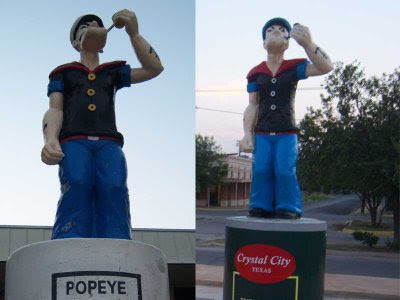 Crystal City, Texas boasts two nearly identical statues of Popeye. The statues are an homage to the town's cash crop of yesteryear and the source of their town nickname: The Spinach Capital of the World. A slightly pre-Gallilean claim, but intriguing nonetheless. All there is left to attest to the unlikely crop that mastered the futility of the borderlands, their green gold, are the two statues, one 72 years old, the other just two, the Del Monte plant on the way out of town and the baby spinach quesadillas on the menu at Miguellitos, a fine Mexican Restaurant that occupies one of Crystal City's oldest and proudest homes--a home built on the confidence of Crystal City's spinach. Crystal City's claim to the Spinach Capital of the World was actually contested by some Missouri backwater, but the small Texas town staked and won their claim on the sole endorsement of Popeye's creator, E.C. Segar, whose signature graces the first Popeye statue built 1937, the same year of the historic row with the Ozarks. The following year, in what must have been a resulting real estate boom, a four-bedroom home was built and touted to be one of the finest homes in the town. That home would eventually come to be Miguellitos, the town's most popular Mexican Restaurant, and offer a Quesadilla-tribute to the town's nicknamesake.